Political Graveyard - Wicomico Co.
Wicomico County, whose name comes from Native American words meaning "place where houses are built", is shown bordered in yellow on the circa-1840 map at right. Wicomico was part of "Old Somerset", which once encompassed the entire lower Eastern Shore area of Maryland and was settled as early as the 1660s. 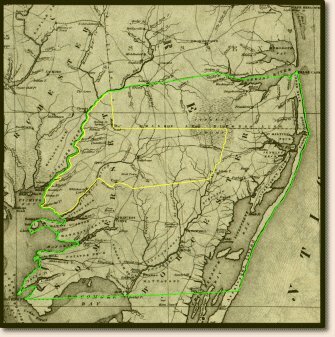 The original boundaries of Somerset County, shown in green, were split in 1742, when Worcester County was formed, and again in 1867 with the formation of Wicomico County from parts of Somerset and Worcester. By 1750, the dispute over the southern boundary of Delaware was finally over, and Lord Baltimore lost the Sussex County area to William Penn. Another close neighbor is Dorchester County, Maryland. Today, Wicomico County is an area of contrasts. The bustling big city atmosphere of the county seat, Salisbury, stands in sharp relief to tranquil, sleepy farming areas like Tyaskin, quiet country villages such as Powellville, quaint fishing towns like Nanticoke, and seemingly untouched, "lost in time" villages such as Whitehaven, where you can still ride a ferry that has been in operation for almost 300 years across the Wicomico River. What's new? We now have the 1877 Lake, Griffing & Stevenson Atlas maps for Wicomico online at the 1877 Atlas page. Enjoy! If you have any comments, concerns, questions, or suggestions regarding the content or coding of any page on this site, or if any of the links do not work, please let me know. Please note . . . I am unable to reply to requests for personal research. I'm not a professional genealogist, and my efforts in my own ancestor quest as well as supporting my web sites are as much time as I can spare away from my own family and job. Please take some time to browse through this website! You will learn about many resources and other types of help that are available to you. If you have questions regarding resources in these counties, or wish to recommend online resources, don't hesitate to write!